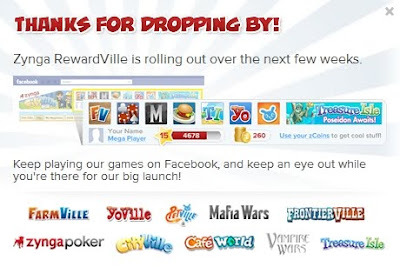 Social gaming giant Zynga will roll out RewardVille over the next few weeks. No, it's not another “Ville” game, it's “a rewards program which lets players earn rewards for Zynga games.” The rewards points, apparently, can be used to purchase items for FarmVille and CityVille among other Zynga games. An update will be posted here once more information become available.